VLADIVOSTOK, September 12. /TASS/. Russian President Vladimir Putin told his Mongolian counterpart on Wednesday that he was pleased by the way bilateral relations develop. "The relations between our nations develop steadily, on the basis of previously made decisions. In general, we are pleased with how it happens," the Russian leader told Mongolian President Khaltmaagiin Battulga during talks held on the sidelines of the Eastern Economic Forum in Vladivostok on Wednesday. 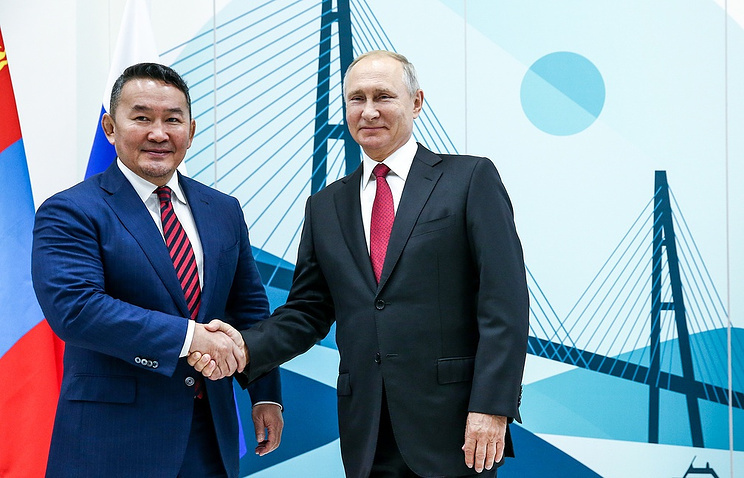 Putin thanked his Mongolian counterpart for heading the Mongolian delegation to the forum in person for the second consecutive year. According to the Russian leader, Russian-Mongolian trade grew by almost 50% last year and by more than 30% in the first half of 2018. "The amount of cargo transit via Ulan-Bator railway and the territory of Mongolia almost tripled last year," Putin said, adding that bilateral economic relations showed positive dynamics in general. "I’m glad to have an opportunity to meet with you and discuss the matters of economic cooperation and other issues," Putin said. The Russian delegation to the Russian-Mongolian talks comprises presidential aides Yuri Ushakov and Igor Levitin, deputy head of the Kremlin administration and presidential spokespman Dmitry Peskov, Foreign Minister Sergei Lavrov, Deputy Prime Minister Yuri Trutnev, Industry and Trade Minister Denis Manturov, Energy Minister Alexander Novak, Rosneft head Igor Sechin and RZD Director General Oleg Belozerov.